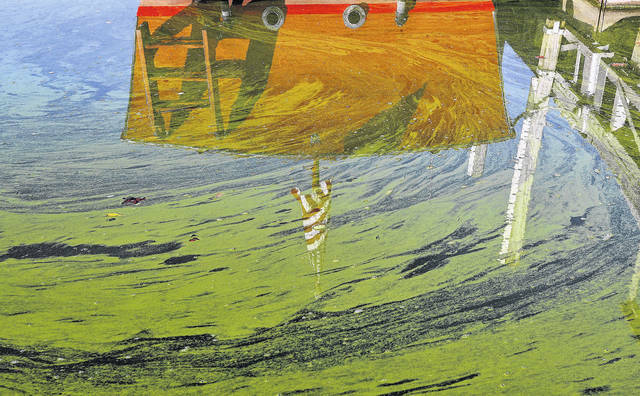 FILE - In this Sept. 15, 2017, file photo, a docked boat is reflected in the algae-covered water of Lake Erie’s Maumee Bay in Oregon, Ohio. Ohio for the first time is declaring western Lake Erie impaired by the toxic algae that has fouled drinking water and closed beaches in recent years. The Ohio Environmental Protection Agency’s announcement Thursday, March 22, 2018, comes amid a federal lawsuit over whether part of the shallowest of the Great Lakes should be declared impaired. TOLEDO, Ohio (AP) — Voluntary steps farmers have taken to scale back the fertilizers feeding Lake Erie’s massive algae blooms aren’t working fast enough, Ohio Gov. John Kasich’s administration said Friday while announcing a set of new proposals. The plan aimed at the agriculture industry and city wastewater plants comes a day after Ohio said the lake’s western end isn’t meeting water quality standards and is impaired by toxic algae. Data clearly points to agriculture as the biggest source of algae-feeding pollutants that flow into the shallowest of the Great Lakes where blooms have contaminated tap water and closed beaches. The state’s strategy for reducing phosphorus-rich runoff, until now, has called for expanding mostly voluntary practices — such as increasing soil testing and installing devices that control storm water. The state also banned spreading manure and fertilizer on frozen and soggy fields. But those aren’t doing enough for Ohio to reach its goal of reducing phosphorus entering the lake by 40 percent within seven years, said Ohio Environmental Protection Agency Director Craig Butler. “The time has come when we can’t rely only on voluntary programs,” he said. The biggest change being proposed would require farmers in what are determined to be distressed watersheds to evaluate their land and reduce the amounts of fertilizer and manure that flows into streams and ends up in Lake Erie. How many farmers that would impact won’t be known until the state determines which areas are responsible for the biggest amounts. It is clear, though, that there would be a cost to those farmers — whether it’s for buying expensive machinery that injects fertilizer into the ground or building storage for livestock manure. Ohio’s largest and most influential agriculture organization believes more time is needed to determine if changes put in place just a few years ago are working before new regulations are added to combat the algae. A big concern, Cornely said, is there’s still uncertainty over the best approach for solving the algae problem. “Farmers are willing to invest in steps to protect the environment, but they want to know it’s the right thing and it’s going to pay off,” he said. The proposals must first clear the state legislature. Another piece of the plan would set new limits on nearly all of Ohio’s wastewater plants to remove more than 2 million pounds of phosphorus that’s dumped into the state’s rivers and streams each year. The Ohio EPA projects it would mean a slight cost increase for households across the state so that plants could make upgrades to the treatment process. But some wastewater plant operators contend limiting their phosphorus discharges would make just a small dent and that the costs are unnecessary, especially for smaller plants that contribute little to the overall phosphorus amounts.